When a family friend was about six years old, he asked if he could be the one to give the prayer at a holiday dinner table. His parents, good Danish Lutherans, were surprised and proud. Imagine a Lutheran who volunteers to pray out loud! Of course they said yes. When the moment arrived young Jason adjusted himself in the chair to begin his prayer. Everyone waited in anticipation of what the precocious little man would say. After all, we grownups seldom have the chops to publicly address the Almighty, making us happy when a child wants the job. Jason bowed his head and offered his prayer. “Hi God” he giggled. That was it. He looked up and reached for the mashed potatoes. Today Jason is a married man and there’s not a holiday prayer that goes by without someone remembering Jason’s relational and oh-so-easy, “Hi God” prayer. Why didn’t any of us think of that? Prayer need not be complicated or formal. Prayer is simply the word we use for talking to and with God-the God I experience as wanting so very much to talk with us, scooting to the edge of God’s chair to hang on our every word, our every hope. Have you found that prayer is less about individual conversations and more about a continuous dialogue? If you talk to God all day long, you’re in good company. For when we believe in an omnipresent God, there is no where we can be where God is not. God is here, there, in our hearts, in our spirits and, if we pay close attention, in our ears. 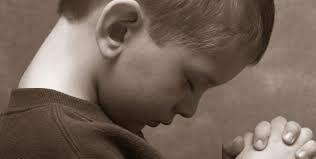 So yes, at its best, prayer is an uncomplicated, easy relational dialogue. But what does God pray for? When Jesus teaches us what we’ve come to know as the Lord’s Prayer, it also teaches us a profound truth about the nature of God. Jesus makes it clear that God knowing our needs before we give them voice does not preclude our asking, directly and pointedly, that God’s will (in other words God’s prayers) be done on earth, not just in heaven. The very fact that children grow up to pray that daddy stop hitting mommy is a sure indication that God’s will is not being done on earth. Your treasure – your perfection – is within you already. But to claim it, we must leave the busy commotion of the mind and abandon the desires of the ego, while we enter into the silence of the heart. There we will find God, waiting for us to spend sacred time together. Where else but the second Sunday after Christmas can we hear about the baby Jesus, his emergency exit to Egypt, the wise men who foiled the insecure King Herod and…the senseless genocide of children. It’s a part of the narrative the bible doesn’t leave out, a part we’re left to consider. It’s not a pleasant thing imagining King Herod butchering all of the little boys, ages two and under. And the bible doesn’t offer any answers. Quite frankly any answer would be wholly inadequate. What kind of world do we live in where this has to be part of the Christmas story? Where’s the hope in that? Answer: THIS is the world that needs saving. Even if we’d rather turn the page and look away. Maybe you feel a little like Phoebe. Maybe you’d like to skip ahead a head to a happier chapter in humanity’s story. That’s actually a pretty reasonable idea. But here’s the thing. If we spend our lives limited to the middle keys of life’s piano, we’ll avoid the low notes and sacrifice the high notes. And that is less than the kind of music God dreams for us. So what can we learn from this story? Can we find the hope, the comfort and the joy of Christmas here? Answer: Yes, but only if we don’t turn away. Perhaps the first need-to-ask question is this. How can we celebrate Joseph and Mary removing baby Jesus to Egypt when that means considering the babies who were not so fortunate? While that may be our first thought, we can celebrate that the holy family found hospitality across a border. Met with welcome and shelter, we’re led to another learning. Anytime Jesus is on the scene, have you noticed that the usual categories of life get scrambled. In this story the Promised Land (Israel) is now the place of danger and the place of slavery and danger (Egypt) becomes the place of welcome. What then constitutes our safety or our refuge? Does geography make us safe or is it something larger and deeper? And why is Matthew quoting Jeremiah? “Rachel weeping for her children, refusing to be consoled, because they are no more.” Can we sit with her anguish? With her children dead or lost, it was natural for Rachel to weep. The bible is honest about the misery of the human condition but it never gives in to it! When we connect the dots of the bible narrative we see that even inconsolable losses will be consoled. Not in this life, perhaps, for we carry some losses to the grave. By quoting Jeremiah, Matthew is telling us that the Messiah came to bring comfort and joy EVEN to the Rachel’s of the world. And what of Jesus? Jesus and his family escape only temporarily, for his time had not yet come. We know how the story ends and that there is a cross in his future. Many years from now he will not run from his own suffering, and he will be with us in ours. Jesus is saved from this massacre so that he can go again to the place of danger, the cross, for our sake. Bringing this story forward to present tense 2014, what do we do with all the pain and suffering found in our world? Cancer? Downed jetliners? War? First, we weep. But then there is a communal call for all of us to be a Rachel in the world, those people who stand watch, naming the need wherever it occurs. Rachel’s people are clear that in the midst of deep suffering, witness and accompaniment are a primary goal. In other words, we go simply to be with them and to dry their tears as best we can. In our culture we do that with food. We bring them a hot dish or a plate of cookies and we hold precious hope that tomorrow will be brighter. Truth is it’s already brighter. Herod is dead. Jesus is alive. All the evil in the world will lose its power. Jesus never will. Letting my mind wander, it also occurred to me that that this assembly experience is a skill set that could be useful –the kind of a skill set we might use to create a better life for ourselves and others. So isn’t it perfect that tonight, on this holy Christmas eve, we are assembled in God’s name to welcome the Christ child? It is here that we are invited to assemble a response to this good news. This baby we welcome needs to be received, cared for and carried out—out into a world that could use some glad tidings, because frankly, the world feels very dark this year, full of violence, unrest and disparity. It would be easy to throw up our hands in defeat, however… if Christmas teaches us anything it’s that we’re not alone in this broken world. God came down in the form of a tiny baby and presto–the Word became flesh. And in that fully human, fully divine act, God came to walk among us. Whatever God hopes for this world, God promises to work in, with, and through us. As long as we can and do assemble a response. Faith doesn’t ask us to hang out in sanctuaries and go home with no thought given to the world God loves. It’s why God assembled a plan to be in relationship with us. When the Holy Spirit showed up at Mary’s side to tell her of their proposed relationship, she didn’t close the door. When the word became flesh she welcomed, carried, and cherished the baby. Hers is an example to follow. In fact, I think that is the big question of Christmas. How can we carry the baby in ways that also say YES to God’s world and God’s children? Could we too make the word flesh by challenging oppression wherever it occurs? The gift of the Christ child is not a gift to put back in the box until next year, but rather it is a gift to share with a world that needs to know they are unconditionally loved, regarded as holy and deserving of a life full of equity and unbridled hope. So tonight, when you’ve put all the toys and bicycles together, take a little time to let your mind wander. 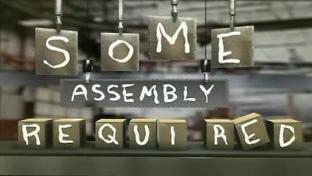 Ask God what about your life could use a little divine assembly or dis-assembly. Like Mary, treasure God’s word and ponder them in your hearts. Living into God’s greatest imagination for your life and this world will always come with the label “some assembly required.” Thanks be to God.